SCVHistory.com HS6007 | Seco Canyon | Corral Drive-In: Small Popcorn Bag, 1950s-1960s. 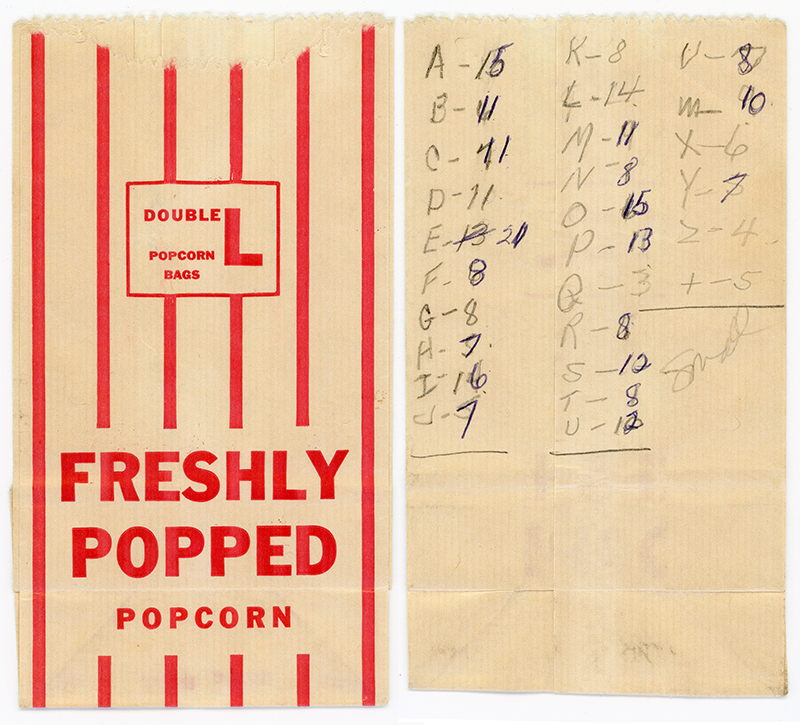 Corral Drive-In: Double L popcorn bag (small), 3½x6½ inches, late 1950s or early 1960s. The writing on the back probably indicates rows of cars and number of small popcorn orders. 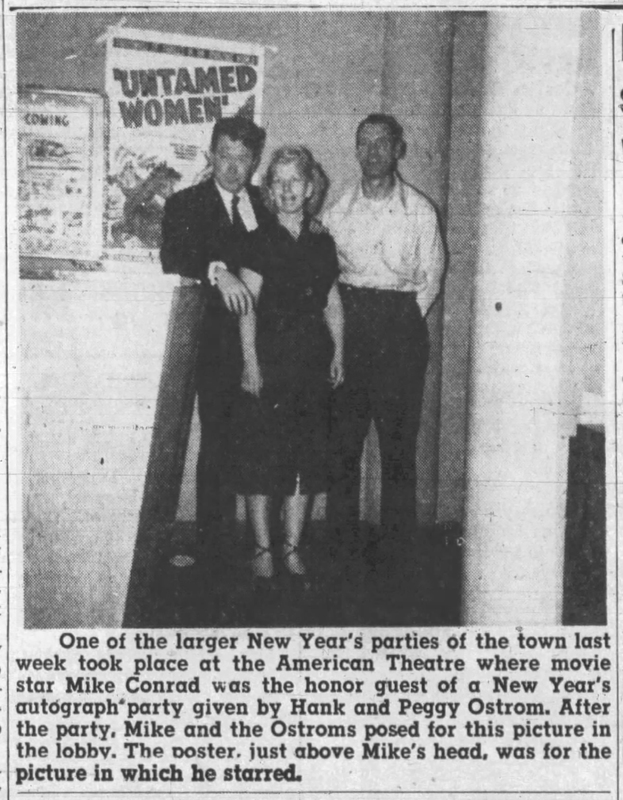 Courtesy of Ron King, whose maternal grandparents were Hank and Peggy Ostrom, owners of the drive-in movie theater in Seco Canyon. Both of the Ostroms were active members of the community. Hank was elected to the board of the Newhall Chamber of Commerce, and Peggy was president of the PTA Council for Soledad Township (the Santa Clarita Valley). 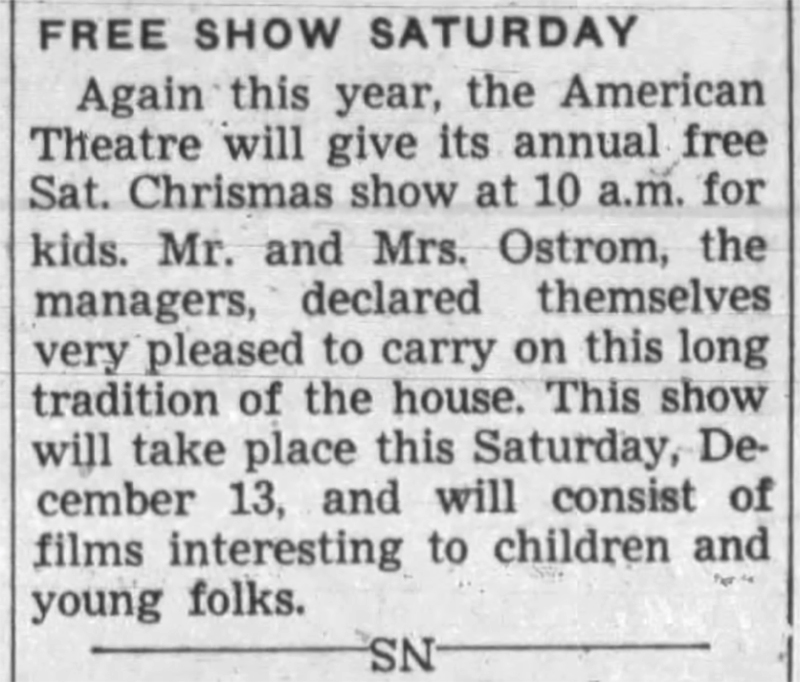 The Ostroms ran the American Theatre for five years and left in 1956 to go into competition with it. Leo T. and Cecelia M. Molitor of Minnesota took over the American on June 1, 1956. 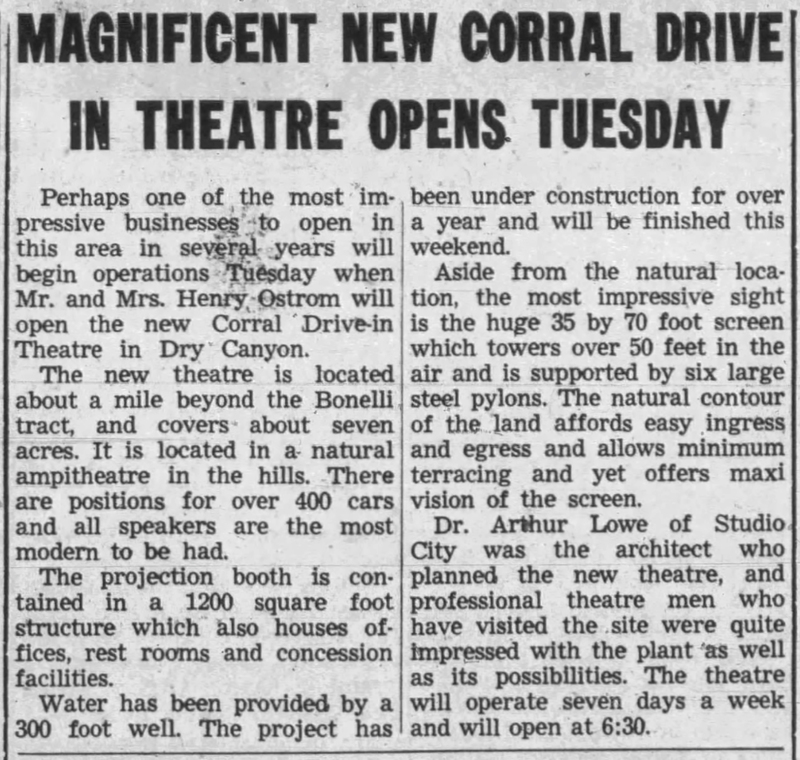 The Ostroms, together with a partner — Louis Wutke, a theater supply store owner from South Los Angeles — developed, owned and, on April 16, 1957, opened the Corral Drive-In on San Francisquito Canyon Road in Seco Canyon. It was designed by D. Arthur Lowe, a civil engineer in Studio City. It included a 35x70-foot screen, spaces for more than 400 cars, a projection booth, offices, restrooms and a concession stand. The Corral was a seasonal operation. 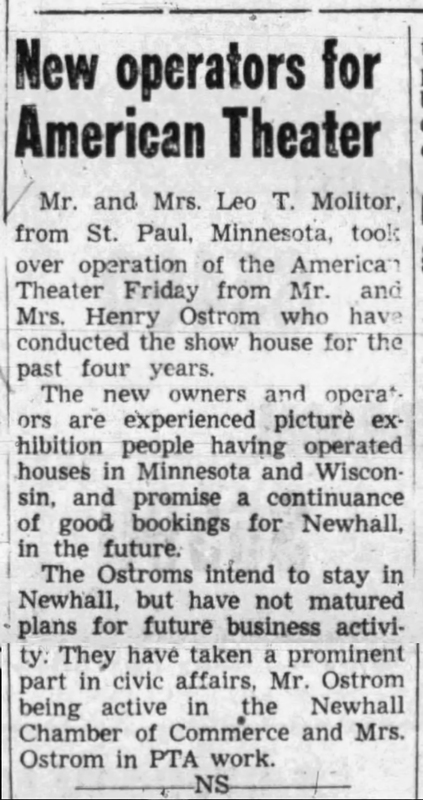 Some years the Ostroms ran it themselves, other years they leased it out to a third-party operator. 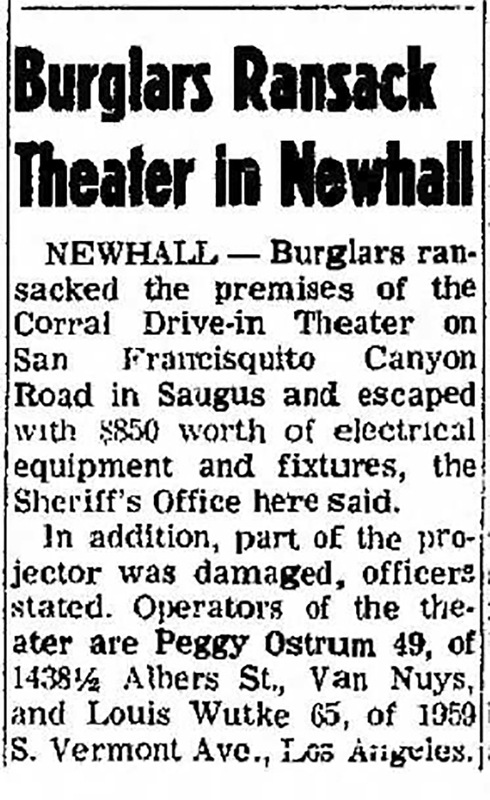 The Corral — phone NEwhall 1394 — had a good run for about a decade. 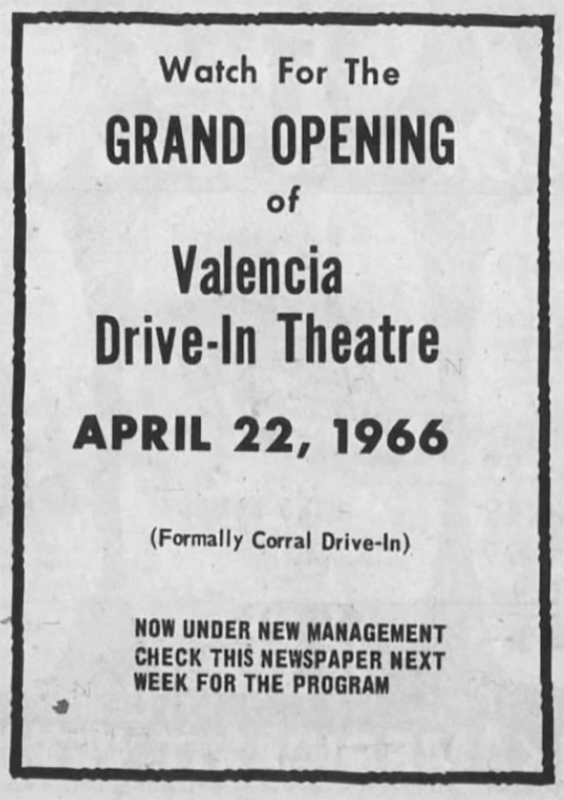 It was the Santa Clarita Valley's only drive-in movie theater until May 1966 when the Mustang Drive-In opened at a more central location, 21021 Soledad Canyon Road. 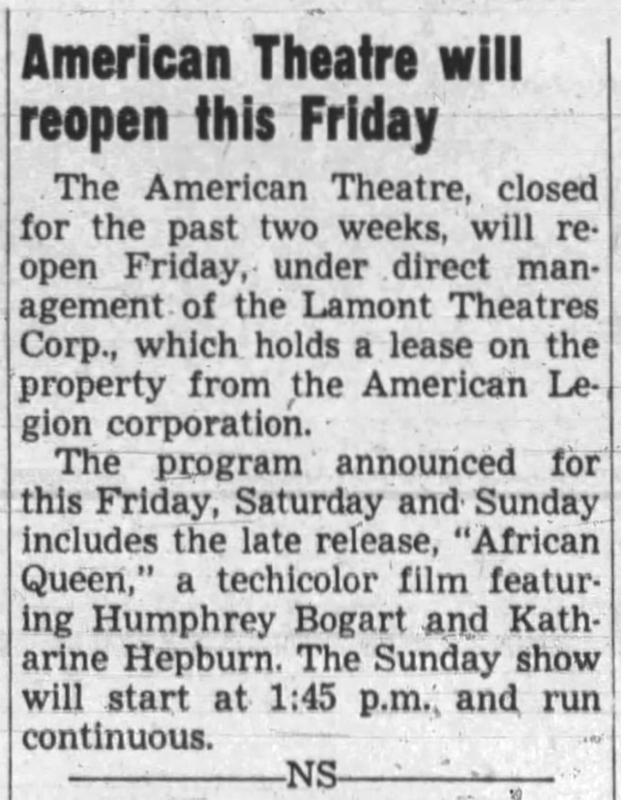 By that time the flashy, new Plaza Theatre had opened on Lyons Avenue (August 1965), driving the dated American Theatre out of business. 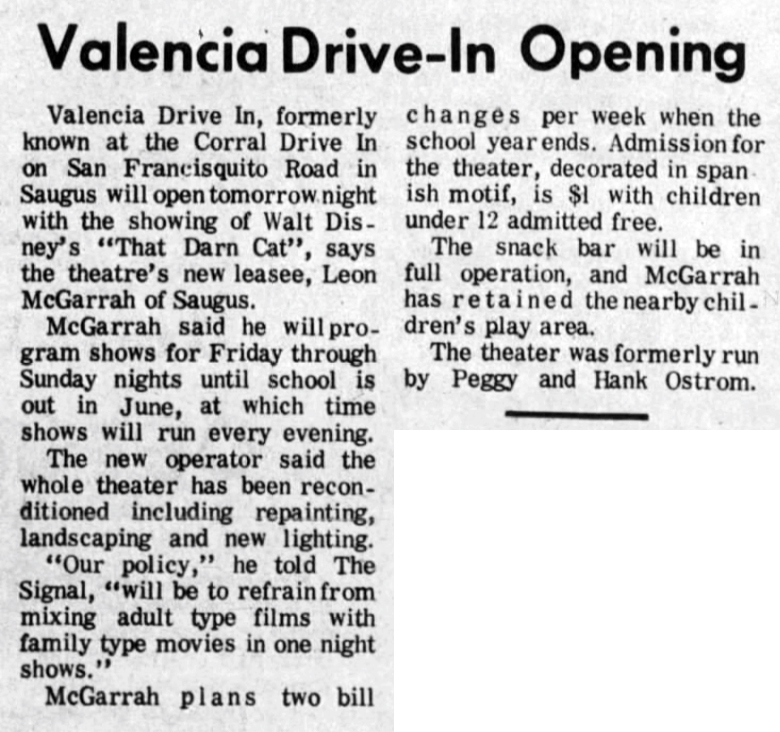 While the Mustang was still under construction, and while Hank and Peggy were in the midst of a divorce after 30 years of marriage, the couple sold the Corral to Seco Canyon residents Leon and Avis M. McGarrah, who reopened it for the 1966 season — its last — on April 22 under the name "Valencia Drive-In." Afterward, Hank Ostrom sold real estate locally. Three decades later, in July 1998, the Corral Drive-In property would be reborn as the new home of Grace Baptist Church, which moved from Placerita Canyon. 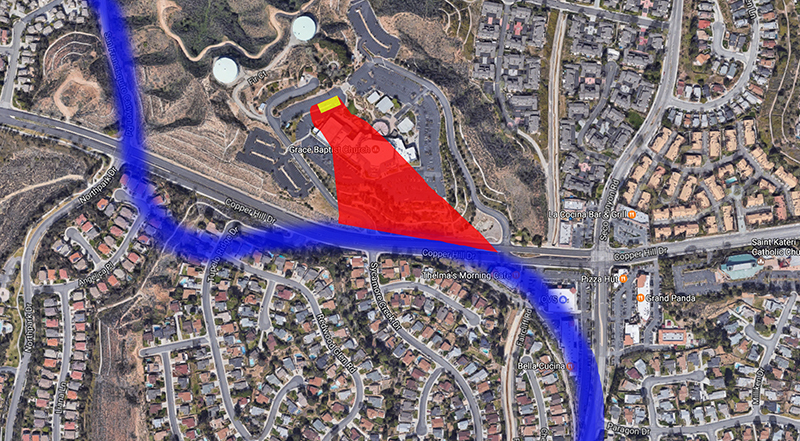 San Francisquito Canyon Road having been reconfigured, the new address is 22833 W. Copper Hill Drive. Nanette Lagasse Gaither remembers (2006): "My family will never forget the first time we went to the [Corral] drive-in after we moved to Saugus in 1964. The drive-in was quite old by then and the screen was leaning or somehow mounted on the mountain slope on the far end of the drive-in. There was a fairly large concession stand. Saugus didn't have many stores and no real entertainment venues back then, and having a drive-in was quite a treat to those of us who moved up from the [San Fernando] Valley." Corral Drive-In location. 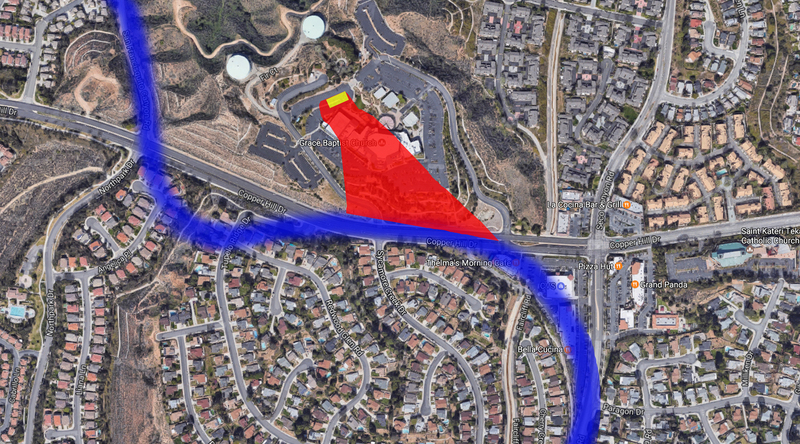 The old San Francisquito/Seco Canyon Road alignment is blue. Yellow is the movie screen. Red is the parking lot. Google Maps image 2017. Layout extrapolated from HistoricAerials.com. Click to enlarge. All The Signal except as noted. Click each to enlarge. 7/24/1952. 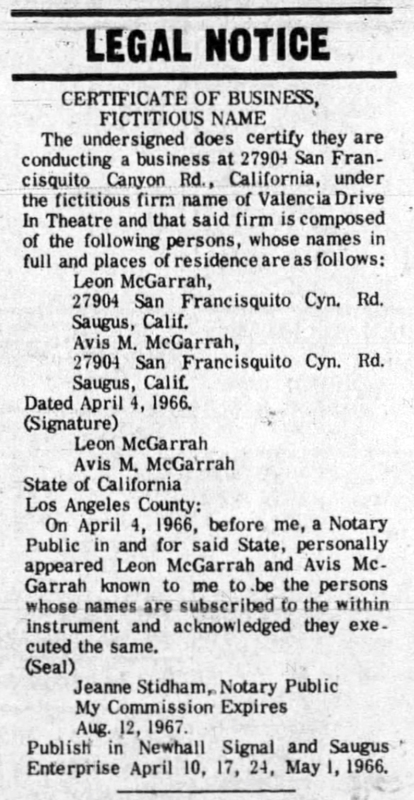 Van Nuys Valley News 4/18/1967. HS6007: Donated to Santa Clarita Valley Historical Soceity by Ron King, July 14, 2018. 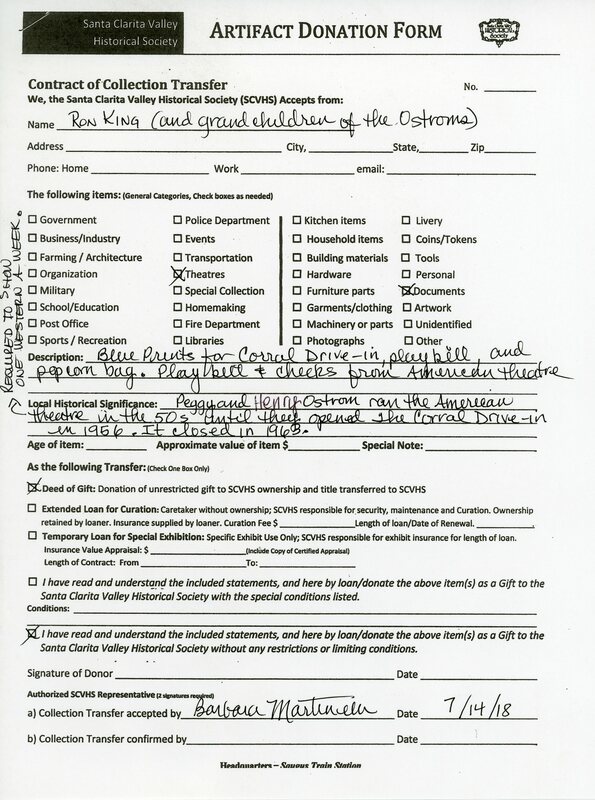 Donation form.